Britain opened 48 consulates in China during the century that began with the Treaty of Nanking in 1842 and ended during the Second World War. Most of the consulates were established at Treaty Ports that were opened for trade between 1843 and 1897: the rest were to keep a watch on rival powers between about 1900 and 1930. To provide the consuls with suitable living and working accommodation, the British government itself needed to design and construct most of the consulate buildings. Its Office of Works opened a small professional office in Shanghai in 1867 for this purpose. It remained there, under a succession of surveyor/architects heads, until 1942 and was responsible for the new buildings at almost all of the consulates in China. These pages describe the origins of these buildings in the rough sequence in which they were procured. Since the middle of the eighteenth century, Canton had been the only port in China where Westerners, foremost among them the East India Company, were permitted to reside and to trade. They were confined to a piece of land, called the Thirteen Factories, on the north bank of the river outside the city walls, in the vicinity of a street now called Shisanhang Road. 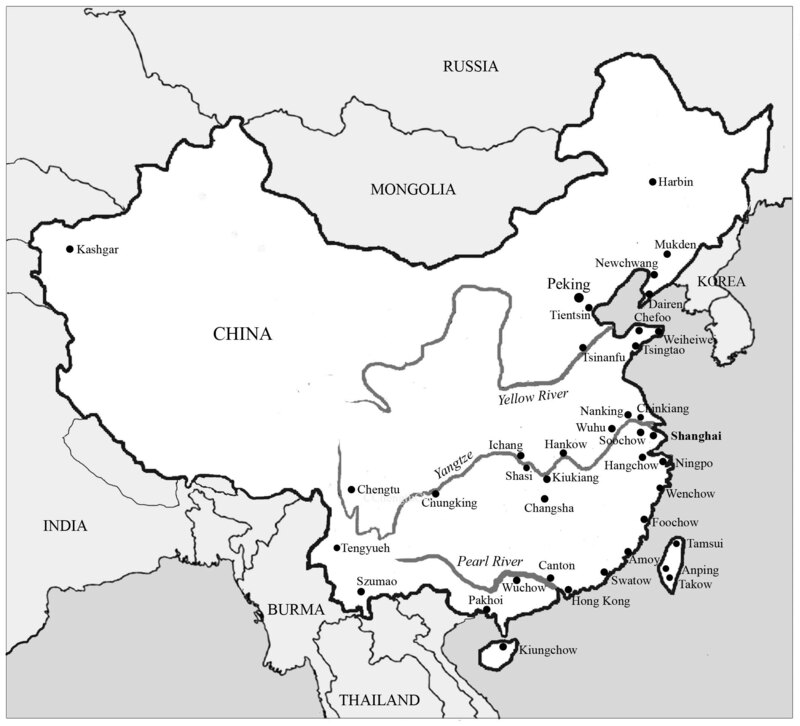 At the end of the First Opium War, and by the Treaty of Nanking that was ratified in 1843, China conceded that Canton and four other ports were to be opened to foreign trade, and that Western traders could live and work at these ports under their own, and not Chinese, laws. This concept of extra-territoriality, and the concession areas in which it operated, were borrowed directly from arrangements developed in the Ottoman lands. It required a British consul to be posted at each treaty port to uphold the treaty terms, protect the interests of the British community and promote its trade, and adjudicate disputes. China also ceded Hong Kong Island to the British in 1842, and it rapidly became a significant British base: the early China consuls reported to the Superintendent of Trade at Hong Kong. Thus started a period of over a hundred years of British consulates in China, during which the Foreign Office established consulates in 48 Chinese cities. A few of them lasted throughout this whole period, some for many decades, others for only a few years, and several for even less.